Last week, GURNER™ unveiled the first designs its most ambitious project to date - the $550m 'Saint Moritz' - located on a high-profile 6,000 sqm site at 14-16 The Esplanade, once occupied by the the Saint Moritz Ice Rink. Now home of the Novotel Hotel the site will be transformed into three, ultra-luxurious 8-storey towers comprising 120 apartments in total as part of a vision for creating "the world’s most exclusive and opulent residential addresses, featuring amenities for residents that exceed standards set in the most luxurious hotels in the world." GURNER™ has engaged Fender Katsalidis and Koichi Takada Architects to amend the permitted plans for the site, which has a long history on Urban.com.au - we first reported on plans for the site four years ago to the day. Fender Katsalidis will assume the role of lead architect for the development while Koichi Takada Architects is responsible for the design of one of the three buildings, providing the development with design diversity. Under revised plans for the site, the number of apartments has been reduced from 240 down to 120 across three buildings - up from the permitted two - set amongst oasis-style landscapes designed by Jack Merlo. 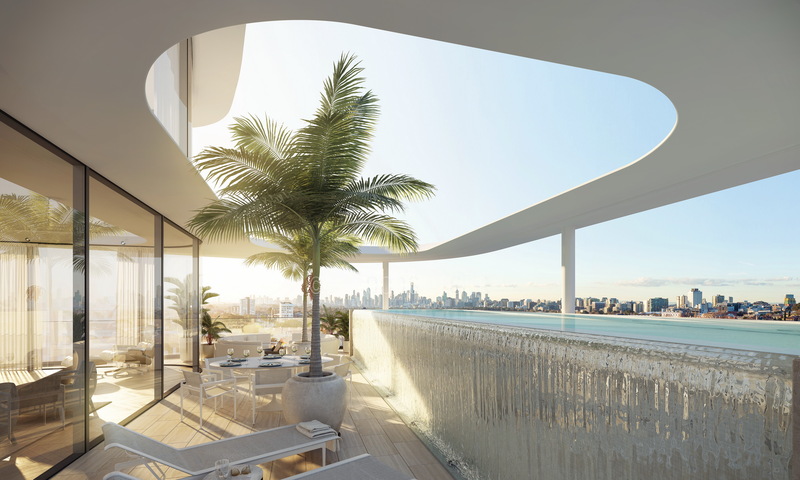 The first of the three buildings, Pacific House, is set to launch to the public in June this year, and will feature 45 residences with an average price-point of $4m and interiors by David Hicks. A $30 million 650sqm penthouse will sit atop Pacific House complete with two private pools, seven bedrooms, a seven car private garage with direct access lift, four living rooms, in-home sauna, gym and 150sqm outdoor terrace offering panoramic views of the bay stretching to the city skyline. The double-storey penthouse was recently snapped up by a high-profile Melbourne family and in the process has smashed Melbourne’s price record for the most expensive apartment sale. The sale, contracted off-market prior to the development’s public launch has achieved an unprecedented rate of $40,000 per square metre. The price is 20 per cent higher than the previous Melbourne record and is the second highest in Australia, second only to the $40m record price achieved for an apartment in Sydney. According to GURNER™ founder and director TIm Gurner, they are currently designing another penthouse in the second building that will be priced in the vicinity of $25m to $30m in response to the successful sale and demand for such a unique offering. This will be launched as part of the ‘Penthouse Collection,' comprising ten residences across the three buildings priced from $5million up to $25million-plus. We believe the luxury end of the market has been waiting for something like this to come along, with significant depth and demand for the right project offering the right level of luxury. 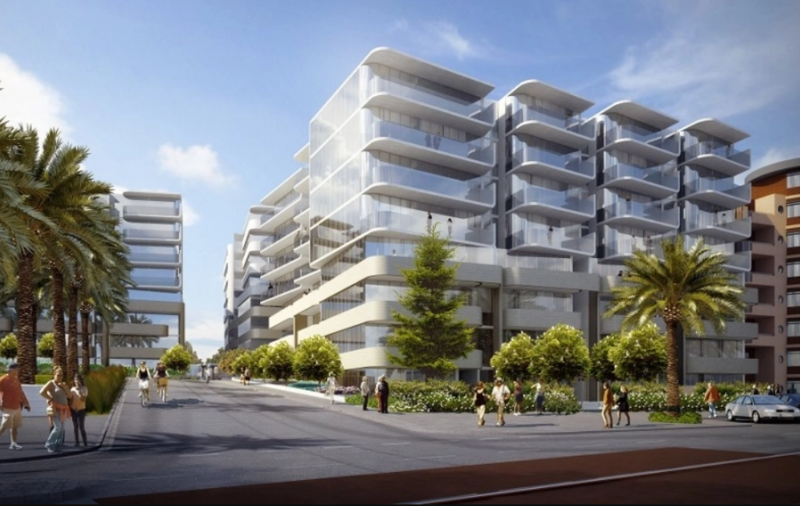 Our vision for Saint Moritz was to reimagine luxury living in Australia, looking to the world’s most iconic luxury waterfront developments to create something that will never be repeated again. This is without a doubt the most ambitious and luxurious development we have ever created and I will ensure personally that every miniscule detail of this project is delivered to far exceed expectations. Karl Fender describes the design as ‘invisible design’ - a timeless masterpiece, with curves inspired by the sand and waves of the bay that will stand the test of time. (The) penthouse has been designed to be the best in Australia and arguably one of the best in the world. We initially designed the penthouse with a floorplan of over 1,300sqm and an even bigger price-tag however the early feedback we have received from our local and international clientele was that a penthouse of this size would be too big even for them. We had no intention of selling the prized penthouse until the launch, but once word got out we were swamped with interested buyers – all local Melbourne identities who quickly realised this will be Melbourne’s and arguably Australia’s best residential address. We had five interested buyers and two quickly became very competitive. We worked with the successful buyer to design and customise the penthouse with them before formalising the sale – a process that has now been completed.